Three Mi 17 helicopters of Indian Air Force undertook flood affected areas of the state of Tripura, particularly in the town of Kailashahar on 15 Jun 18. 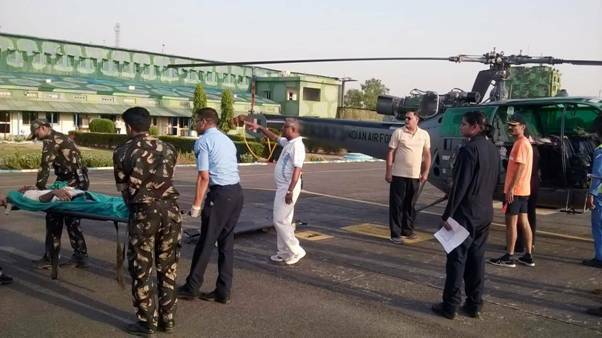 The helicopters are operating from Radhanagar helipad located about nine kilometers from Kailashahar and 4.1 tons of food and other essential supplies were delivered to the affected people in the area. An all women Naval mountaineering team led by Lt Cdr Kokila Sajwan summited Mount Deotibba an 10 Jun 2018. 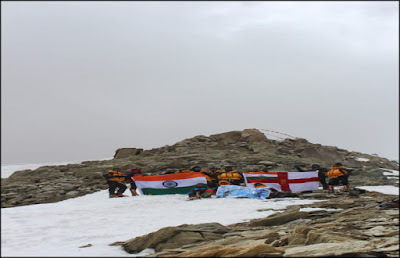 The exp[edition was flagged off by Vice Admiral AK Chawla, AVSM, NM, VSM, Chief Of Personnel on 28 May 18 from New Delhi laying foundation for a team, which would attempt to scale many more challenging peaks in the near future. 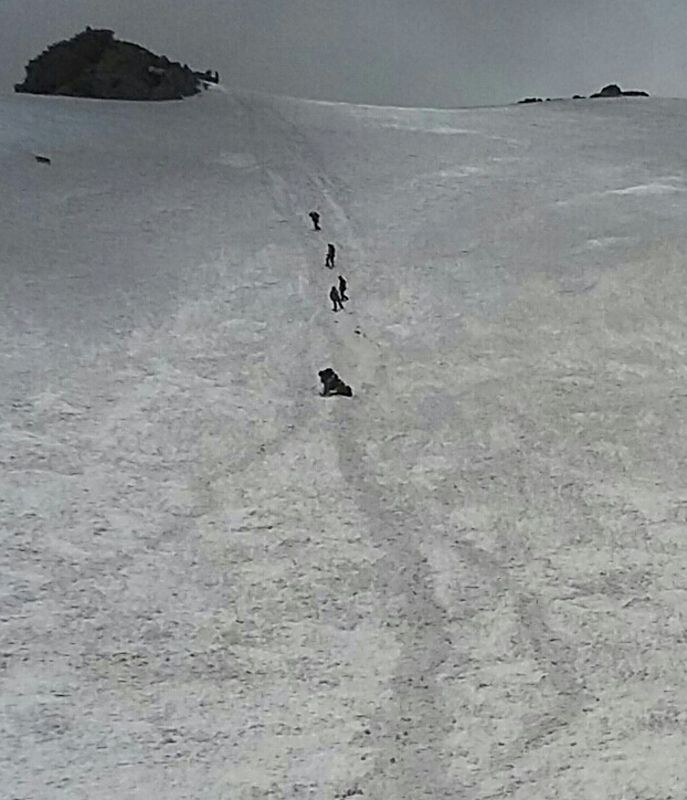 Mount Deotibba provided excellent opportunity to the team in honing their mountaineering skills. Mt Deotibba is the second highest peak (6001M) in the Pir-Panjal range in Himachal Pradesh. 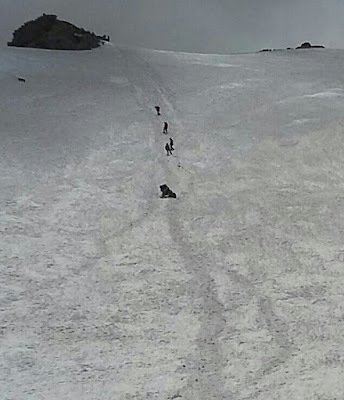 It is considered to be a difficult peak to summit. 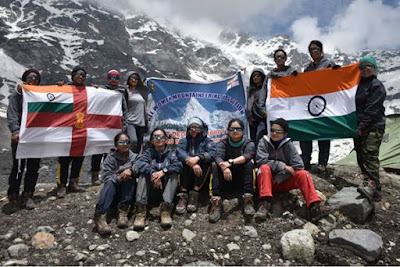 The team was led by Lt Cdr Kokila Sajwan and includes Lt Cdr Nanadini Dam Roy, Lt Cdr Seema Chaudhary, Lt Cdr Pooja Sharma, Lt Cdr Rekha Shree, Lt Cdr Rashu Tyagi, Lt Saino Wilson, Lt Chamm Kumari, Surg Lt Himwant Kaur, Lt Surbhi Sharma, Lt Shristi Thakur, Lt Vipasha Sharma, Lt Kritika Sharma as other team members. 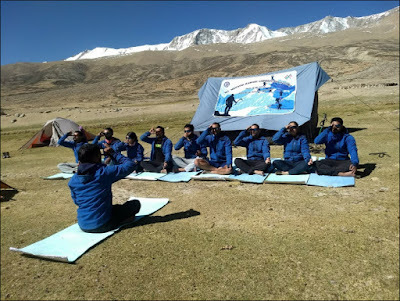 The team started the trek from the road head (Bara Hazari) to the base camp at an altitude of 4250 mtrs through Chikka and Seri. 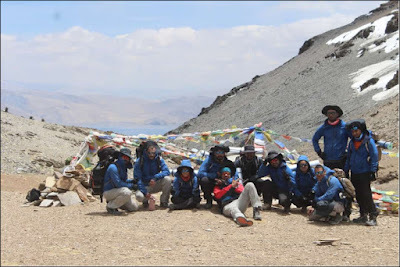 They advanced towards the Summit through advance base camp at 4700 mtrs and the Summit camp at 5250 mtrs. 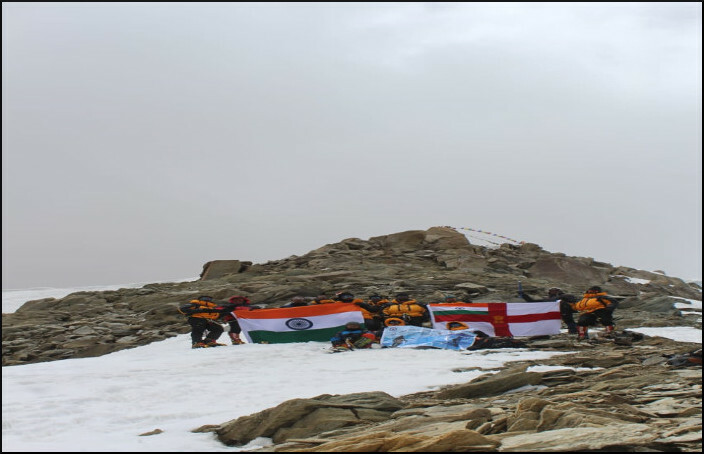 Displaying exemplary courage and esprit de corps, the team battled extreme weather conditions including white outs and heavy snowfall accompanied by strong winds. After a strenuous push of about 12 hrs of climbing, the team summited the peak at 1300 hrs on 10 Jun 2018. On 13 Jun 18, Chetak Helicopter of Indian Air Forceundertook a challenging evacuation of two lying casualties to Jammu from a location of 8800 Ft altitude, injured in a bus accident. One lady aged 23 years with pelvic and multiple fracture and one male aged 32 years with spinal trauma along with one attendant were evacuated. 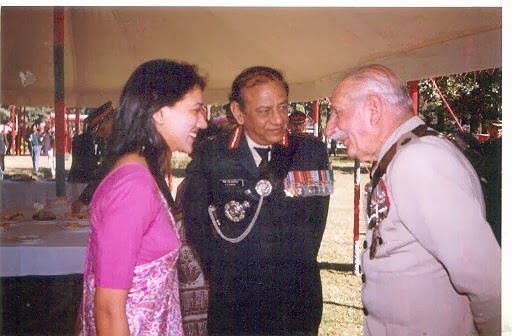 The Chetak helicopter was flown by Wing Commander Vishal Mehta with Squadron Leader S Selva Kumar as co-pilot. The third casualty along with the attendant was evacuated from the same place to Udhampur as the patient becoming convulsive enroute to Jammu. 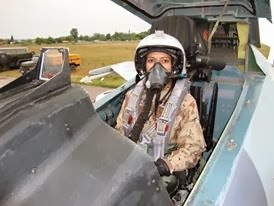 The Cheetah helicopter was flown by Wing Commander AH Kulkarni with co-pilot Squadron Leader Rajat Sharma. 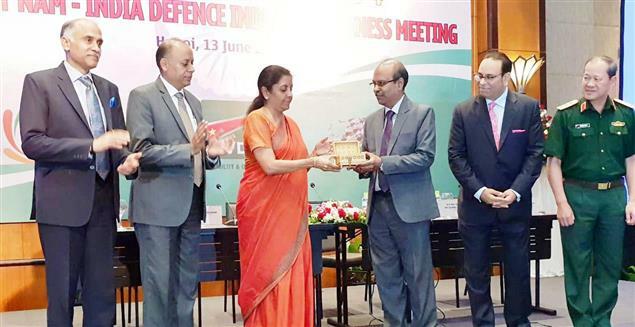 Ms. Nirmala Sitharaman, Minister of Defence, Govt. of India today said that there is immense potential to be explored by Indian defence industry in Vietnam in areas of co-production of platforms, spares, repair and overhaul services. Inaugurating the Bharat Electronics Limited (BEL) liaison office in Hanoi, Vietnam at the Business Interaction organized by FICCI, Ms. Sitharaman handed over a symbolic key to Mr. M.V Gowtama, CMD, BEL. The interaction was held between the defence sector companies from India and Vietnam, and senior officials of Vietnam’s military. 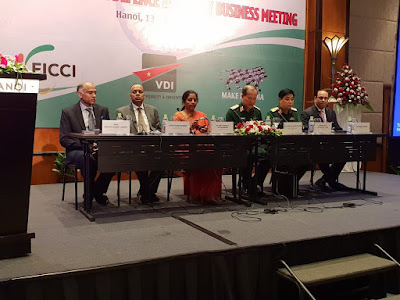 The FICCI led Indian delegation saw participation by leading members from both private and public sector of the Indian defence industry looking to enter the Vietnam market. In her keynote address, Ms. Nirmala Sitharaman, Defence Minister, Govt. of India said that the sprit and mood of her discussion with the Defence Minister of Vietnam had been very forward looking and encouraging. “There is immense scope in the co-production of platform, spares, and repair and overhaul services”, she said. Citing BEL as an example, she said that the opening of offices of Indian defence companies highlights the seriousness of the commitment to doing business with Vietnam. India has enjoyed robust defence cooperation with Vietnam, as both India and Vietnam largely rely on Russian military hardware, there has been significant bilateral cooperation between the two nations. This includes MRO services for Vietnam’s MiG aircraft, providing the Vietnam People’s Navy with submarine training, and providing technical training for vessel construction. India and Vietnam have agreed to take forward a proposal for training of Vietnam Air Force personnel on Su-30 aircraft. Vietnamese Deputy Defence Minister of National Defence, Senior Colonel General, Mr. Be Xuan Trong was also enthusiastic for the future Indo-Vietnamese relations, saying that “Bilateral defence relations between the two countries was finally getting its due”. He invited Indian companies to set-up business in Vietnam with the intent of not just supplying to India and Vietnam but also to the other countries. 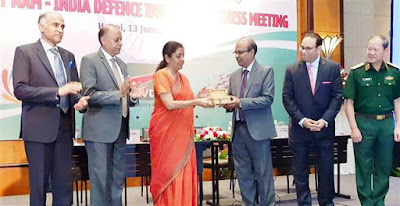 Mr. Parvathaneni Harish, Indian Ambassador to Vietnam said that the defence industry requires a particular focus and it traverses both economic and security aspects. He noted that the Vietnamese companies have developed an interest in Indian businesses looking at Vietnam for electronics, maritime, aerospace sectors. Bilateral interactions such as the one set up by FICCI have strengthen the comprehensive engagements with Vietnam. Exercise SURYA KIRAN-XIII, a joint military training exercise between India & Nepal culminated today at Pithoragarh, wherein the troops of both Armies participated in 14-day long joint training based on counter terrorist operations. The training culminated with a 72-hour outdoor exercise in which troops of both contingents carried out a Cordon and Search Operation in a mock counter-insurgency village. During the final phase of the exercise, Maj Gen Neeraj Verma, Chief of Staff, HQ UB Area was present as Observer Representative of Indian Army and Maj Gen Rajendra Karki, Division Commander, Mid Western Division was present from Nepal Army. Besides training, both the contingents also participated in a number of extra-curricular activities including friendly Football, Basketball, Volleyball matches and a cultural event on the final day to increase the bonhomie between troops. The joint training was undoubtedly, an unprecedented success. Besides promoting understanding and inter-operability between the two armies, it further helped in cementing ties between both the nations. 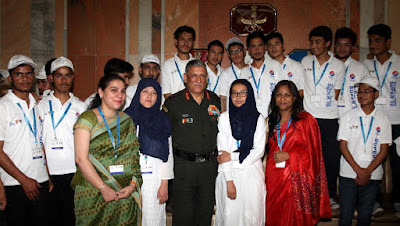 Project Kashmir Super 50, a joint initiative by Indian Army, Center for Social Responsibility and Leadership (CSRL) and PETRONET LNG Limited (PLL) was launched on 22 March 2013 to transform the educational status of children from economically weaker sections in the Kashmir region. As part of the 11-month program, selected students are provided with complete free residential coaching for IIT-JEE, JKCET and other premier Engineering Institutes. The outgoing batch is the fifth batch of Kashmir Super 50 which had 45 boys based in Srinagar and five girl students based in Noida. Out of which this year, 32 students (30 boys and 02 girls) have cleared IIT-JEE Mains and seven students have cleared IIT-JEE Advance. A group of 30 students, part of Kashmir Super 50 visited New Delhi and interacted with General Bipin Rawat, Chief of the Army Staff on 12 Jun 18. The General shared his experiences while serving in these areas, with the students and motivated them to work hard & contribute actively in the nation building process. 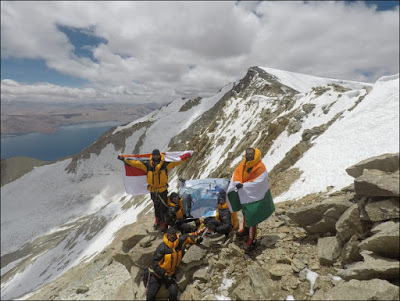 Setting foot atop Mt Mentok Kangri, a challenging 6250 meters peak, the mission on which 11 mountaineers including two women officers of Eastern Naval Command (ENC) embarked in end May 2018 was realised when all members successfully submitted Mt Mentok Kangri located in Rupshu plateau in Eastern Leh on 10 June 2018. The expedition included a weeks approach trek from Tsokar lake, crossing four high passes ranging from 4800 meters-5400 meters and reaching base camp at 5300 meters and the team could finally summit the peak after a daunting and extremely challenging summit climb of 11 hrs including a 70 degrees wall of around 350meters , traversing through the glacier in 10-15 knots winds with occasional snowfall throughout the climb. The team also undertook yoga practise enroute as a run up to the International Yoga Day being celebrated on 21 June 2018 across the world. Apropos some apprehensions noticed in the section of the media about flying operations from naval airfield at Visakhapatnam, it is clarified that Indian Navy has proposed to dedicate time slots for civil and military flying operations at Visakhapatnam airport to ensure synergy of airspace management and facilitate safe conduct of both civil and military flying operations. The Navy’s proposal is on the lines of similar arrangements existing at other joint civil-military aerodromes such as Goa, Pune etc. Visakhapatnam is a dual user airport where civil and military flying from INS Dega is undertaken concurrently. Over the past five years, both civil and military flying from Visakhapatnam has witnessed a steep increase in numbers and passenger volumes. Presently, around forty civil flights operate from Visakhapatnam constituting eighty movements of civil aircraft per day. 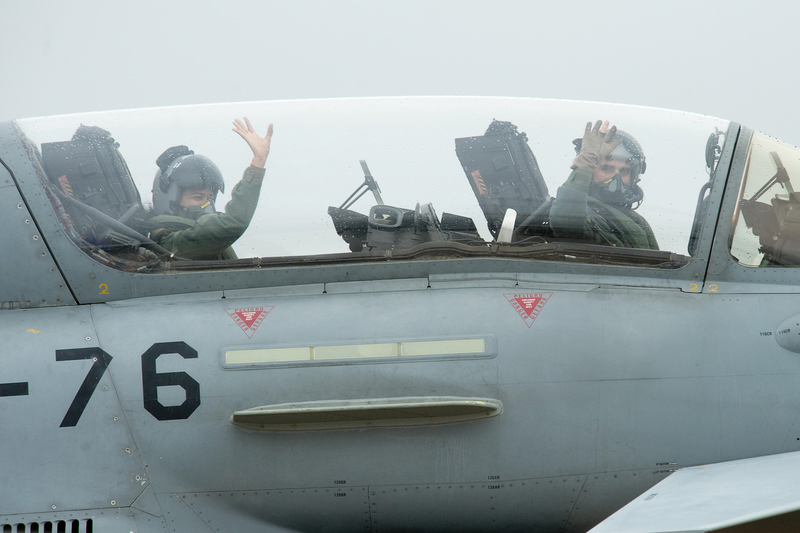 Military flying from INS Dega has also increased significantly due to enhanced surveillance requirements on the Eastern sea board and induction of fighter squadrons for training and operations. On an average, there are 90 to 100 military aircraft movements every day. With simultaneous civil and military aircraft operations on a unidirectional runway, which is peculiar to Visakhapatnam, landing and takeoffs of civil flights encounter delays thereby inconveniencing passengers and affecting connecting flight schedules. After deliberations and concurrence of all airline operators and Airport Director Visakhapatnam, dedicated time slots for exclusive military flying were proposed from 09:30 AM to 12:30 PM between Monday to Friday, 03:00 PM to 05:00 PM on Tuesday and Thursday, 07:00 PM to 09:00 PM on Tuesday and Thursday. Subsequently the proposal is further being reviewed to have dedicated military flying slot only from 09:30 AM to 12:30 PM between Monday to Friday. The above time slot has been arrived at taking into account frequency of movement of civil flights to ensure least disturbance. Out of the forty civil flights daily, on an average only six to eight civil flights operate between 09:30 AM to 12:30 PM. A final decision on the proposed dedicated military slots will only be taken post discussions with AAI and Airline operators at Integrated Headquarters Ministry of Defence (Navy), New Delhi. The Navy’s proposal is intended to synergise civil and military flying, enhance safety on a unidirectional runway and minimise delays in arrival and departure of civil flights. The proposal will not restrict or reduce the number of civil flights operating from Visakhapatnam. Operations of air ambulance flights, aircraft in emergency and VIP flights would continue to be accorded priority at all times over both civil and military flying as hitherto fore. Based on a request from Cochin Port Trust at about 1845 hours on 13 June 2018, Southern Naval Command launched an ALH helicopter and dispatched INS Kalpeni to provide assistance to Indian merchant ship MV Nu Shi Nalini anchored 14.5 nautical miles South West of Kochi. The ship had reported a fire incident on board in which a crew member, Yogesh Kanji Solanki, Trainee Mechanical Engineer was reported to have suffered 80% burns as a result of the fire. The casualty was winched up from the deck of the ship using a 'basket' by the ALH, whose pilots displayed great skill in the face of adverse weather conditions, including gusting winds and torrential rain, and brought to Naval Air Station INS Garuda. The patient was thereafter shifted to Medical Trust hospital for further treatment. The fire is reported to have started in the engine room of the merchant vessel, apparently due to an internal explosion. MV Nu Shi Nalini is a chemical tanker, which was carrying naphtha. The fire was brought under control and rest of the crew is reported to be safe. Naval ships are maintaining in close vicinity of the merchant vessel and will undertake evacuation of the remaining crew, if required. On the momentous occasion of successful completion of Pre-Commissioning training by the Flight Cadets of various branches of Indian Air Force (IAF), a grand ceremony, known as ‘Combined Graduation Parade’ (CGP), will be held on 16 Jun 2018 (Saturday), at Air Force Academy, Dundigal near Hyderabad. Air Chief Marshal Birender Singh Dhanoa, the Chief of Air Staff will be the Chief Guest at this grand event. He will review the Passing out Parade and confer the ‘President’s Commission’ on behalf of the Honourable President of India, to the graduating trainees of various branches. The Chief of Air Staffwill also present the ‘Wings and Brevets’ to the newly commissioned officers of the Flying branch and to the officers from sister services i.e. 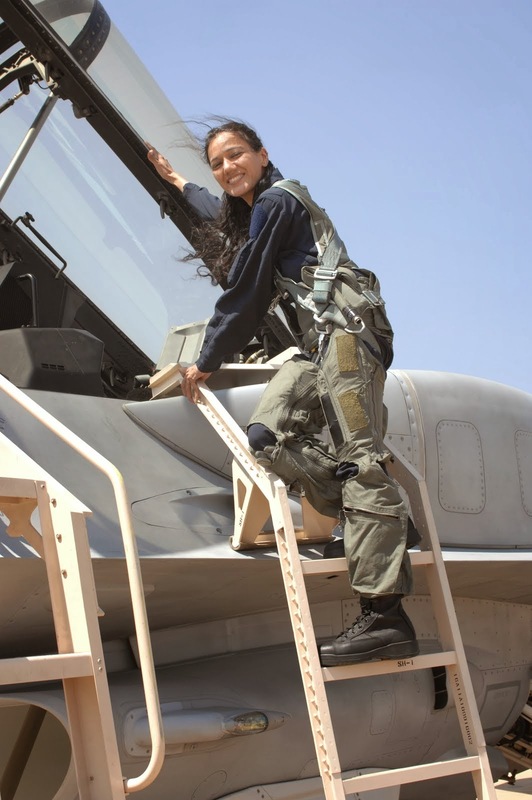 Navy and Coast Guard who have successfully undergone the Flying training, which is a significant milestone in every Military Aviator’s career. The Reviewing Officer will present the President’s Plaque and the ‘Sword of Honour’ to the Flight Cadet standing first in the Order of Merit in ‘Flying Branch’ who will also have the privilege of commanding the Graduation Parade. The Reviewing Officer will also award the President’s Plaque to the toppers (first in Overall Merit) in the Navigation branch and Ground Duty branches of the graduating course. On the eve of the Graduation, the Reviewing Officer would also attend the Ceremonial Guest Night and interact with graduating trainees and their proud parents. During this event, he will award trophies to the Flight Cadets who have excelled in their respective streams. The Pre-Commissioning training at Air Force Academy, for various branches such as Flying, Navigation, Administration, Logistics, Accounts, Education and Meteorology commences in January and July every year, and culminates with the ‘Combined Graduation Parade’ after nearly 12 months of rigorous training in December and June respectively. It is at AFA, the raw civilians are transformed into capable and efficient leaders to safeguard the aerospace of the Nation and shoulder the responsibility in their respective spheres of operations of the IAF. 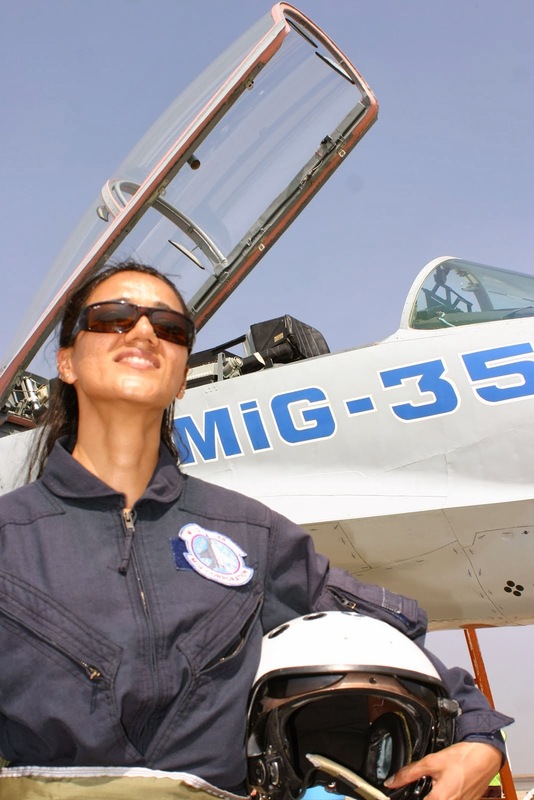 On Commissioning, they are awarded with the rank of ‘Flying Officer’ in the IAF.